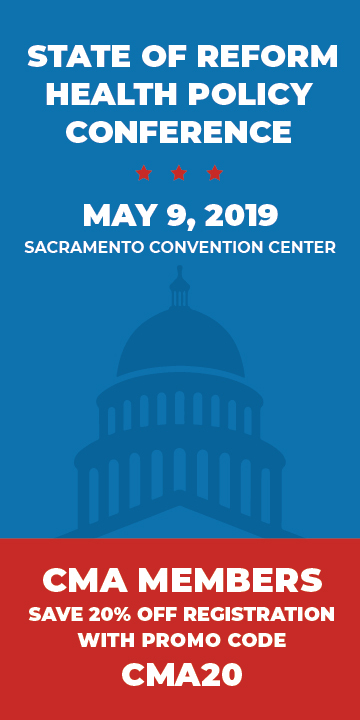 The California Medical Association (CMA) works tirelessly on behalf of its more than 44,000 members to support physician-led advocacy from legislation and policy-making to regulatory and legal affairs to practice management and reimbursement assistance. 1. Secured Governor Jerry Brown’s signature on the Proposition 56 supplemental budget bill, which appropriates over $1 billion in funding for improved access to care. 2. Secured (with plans for Physicians for Healthy California to administer) $220 million to establish a loan repayment program to incentivize physicians and dentists to serve Medi-Cal patients and $40 million for the University of California to support, retain and expand physicians trained in California. 3. Defended the medical profession and patients from dangerous legislation that would have significantly cut physician reimbursement without improving patient outcomes, including AB 3087 (Kalra), which would have limited access to health care providers, created state-sanctioned rationing and increased out-of-pocket costs for patients. 4. Helped the Tulare Regional Medical Center medical staff reach a favorable and historic legal settlement to restore independence and self-governance against the hospital, resulting in the hospital reopening on October 15. View Part 1 and Part 2 of CMA’s documentary recapping the effort. 5. Achieved record-setting 6.24 percent increase of membership with a 92 percent retention rate. Learn more about CMA’s membership benefits here. 6. Launched members-only mobile app, as well as updated brands and websites for CMA, PHC, CALPAC and 20+ component medical societies. 7. Stopped predatory practices by health insurance companies, including attempts to substantially limit same-day services (modifier -25 payments) and automatically downcode emergency services based upon the ultimate diagnosis. 8. Secured $30 million commitment from Blue Shield of California to support the launch of a Physician Services Organization (PSO). This partnership will support a new model that provides Californians access to quality, comprehensive and sustainably affordable care to improve the health of individuals and their communities. 9. Drafted and filed a 2020 Sugar-Sweetened Beverages (SSB) tax ballot initiative in response to the cynical soda industry-backed bill to stifle SSB taxes and their corresponding public health protections. Learn more by reading CMA’s op-ed by Theodore M. Mazer, M.D. 10. 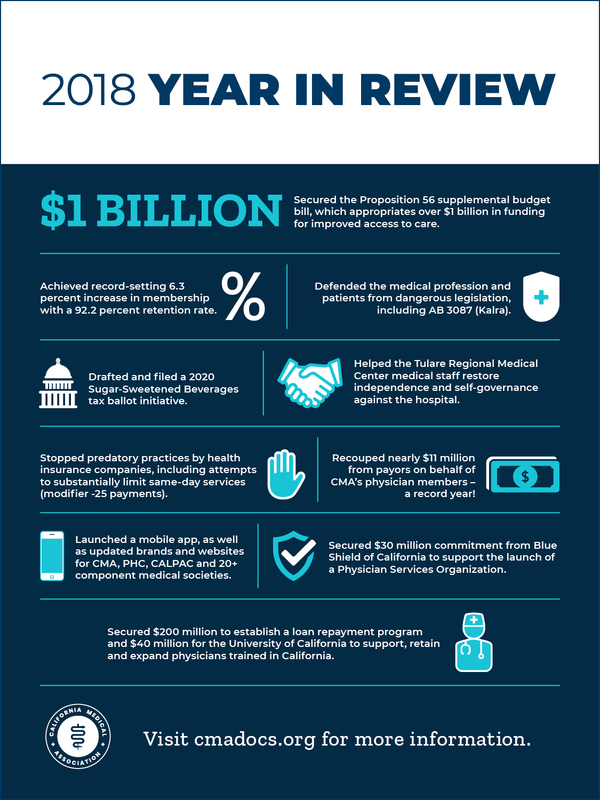 Recouped nearly $11 million from payors on behalf of CMA’s physician members – a record year! Learn more about CMA’s practice management resources here. From public health to MICRA to physician workforce, explore CMA's top policy and advocacy priorities.